Divided from a close friend by death, from her twin sons by the impenetrable fog of adolescence, the pushing-50 author wanted to “find a divide that could be crossed.” So on August 29, 2001, she swam across the Hudson River. Less than two weeks later, the World Trade Center towers fell. 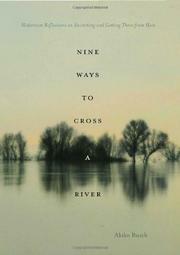 After that, Busch explains, she decided “to begin each autumn by swimming across a river, some small, personal trial by water that could secure safe passage into the coming year.” By 2005 she had traveled to nine rivers and swum across eight, discovering along the way stories of transformation and renewal. Beginning close to home in New York, then moving west to the Mississippi, Busch captures the character and history of each river. She draws on the writings of Least Heat-Moon, Edward Abbey, Mark Twain and Bill Bryson, among others; the technical expertise of engineers; the practical knowledge of park rangers, campers and assorted river lovers, including Pete Seeger; and her own observations and impressions. We learn that the sweet-flavored Hudson flows both north and south, that the Delaware has swift currents, boulders and deep pools, that the Susquehanna is unnaturally warm. The beautiful Connecticut River has black silt; the busy Mississippi and the Monongahela rivers are brown and muddy; the Cheat and Current rivers are clear and green. Forethought, research and careful planning generally preceded Busch’s ventures, except for a projected swim across the Ohio, derailed by reliance on luck and happenstance. Her friend Onni was usually her swimming partner, and on heavily trafficked rivers a raft or boat accompanied her for safety. In the deepest sense, however, these were solitary journeys exploring an internal landscape as well as connecting to the natural world around her.